When my son started first grade this year and was going to be gone all day, I decided that he was going to take a lunch from home. I wanted to do more than just normal sandwiches and make it fun, so I am going to share a couple of things that he has in his lunch each week. I also pack a lunch for my 16-year old brother, so keep in mind these are all good for any age, even me. 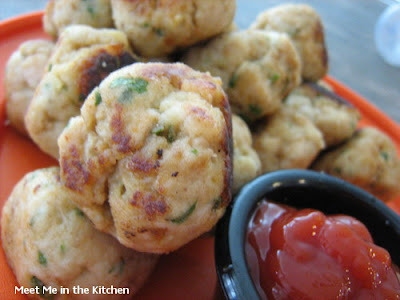 First, the chicken balls. How cute are those? They are good cold or warm and you can send some ketchup in a little container for dipping. They were a big hit, as were the mini caramel apples. We made some with butterscotch chips and some with peanut butter chips. Everyone liked the peanut butter variety better. My son was really proud to take those because he helped me make them the night before. Then the mini bagel sammy, kind of fun and totally adaptable to any kind of sandwich toppings and fillings. The fruit and yogurt parfait was loved because of the homemade granola, I even had one myself for breakfast. By the way, I made a batch of that granola which disappeared in less than 24 hours and it was requested I make more. I doubled it the next day and it only lasted 36 hours! On a side note, I did send a cold ear of corn and edamame in their lunches and both were enjoyed. Creativity and Variety are key to not getting bored with Lunch! Using your hands, squeeze out some of the excess liquid from the grated apple. Put the apple, chicken, onion, parsley, thyme, bread crumbs, and chicken bouillon into a food processor. Process until a smooth mixture forms a ball. Season with a little salt and pepper. With your hands, form the mixture into about 20 balls, roll in flour, and fry in the oil,( I added a little cooking spray as well) for about 10 minutes, until lightly golden and cooked through. Step 1 First, cut the lollipop sticks in half at an angle (the pointy end will go into the apple pieces easier). With the melon baller, scoop little balls out of the apple. Each ball should have a section of apple peel. Push half of a lollipop stick into the peel of each ball. Pat the apple pieces dry. Step 2 Melt the chips according to the package directions. 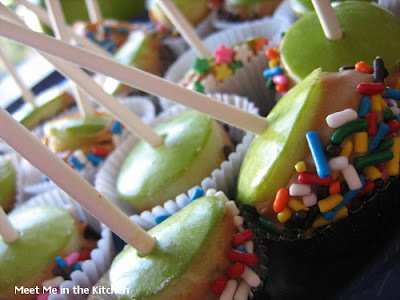 Dip and swirl the mini apples in the melted chips, then roll the apples in nuts, sprinkles, nonpareils, or coconut, if desired. 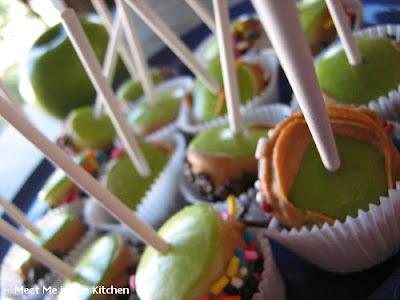 Place the mini apples in paper candy cups to set. Spread a small amount of cream cheese on both sides of mini bagel. Layer lunchmeat, spinach, cucumber, carrots, and sprouts on top. Place tomatoes in a separate baggie to be added later, so it doesn't make anything mushy. Put bagel half on top and pack! Pack the granola in a plastic container. 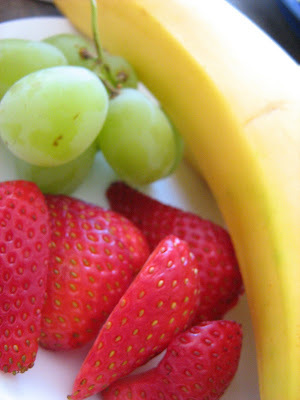 Put the fruit in separate container or sandwich baggie and assemble parfait when lunch is to be eaten. If using Greek yogurt, you might swirl in a little honey. I am glad to see a post on lunchbox ideas. I have been trying to figure out ways to spice up my kids lunches. 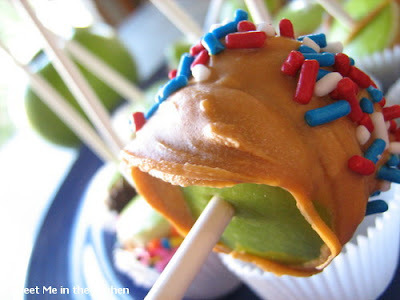 I absolutely love the mini caramel apples because my kids love caramel apples but they are usually too much for one person... this is perfect! Thanks for sharing. Please, please, please can I come over for lunch? Those all look so wondeful and what a funny coincidence that the desnews was all about lunch foods this week too. I didn't know my recipe was in today, so thanks for telling me. My paperboy doesn't get out of bed until way after nine. seriously! You could have submitted all of these recipes, woman. They look out of this world. I want to go to school just so I can have a lunch like this! What great ideas! How awesome are those little apple sticks! Great idea! How cute are those mini caramel apples!?? I love them. Totally have to make them for my next party. Thanks for sharing! My son is starting first grade too this year. What a great lunch box idea. Your son is going to be one popular kid at the lunch table. :-) I am bookmarking it. Thank you Mary Ann. Love, Love, Love all of these ideas. One of my friends made those little mini caramel apples and I thought they were the cutest things ever! What a great post. I am digging those chicken balls too! Ok, that didn't sound right. You know what I mean! You are the best mom and sister!! Wow! I bet they love opening up their lunchboxes! I saw those little apple treats in the FF mag, they are so cute and look great! I think my son will get a kick out of those. 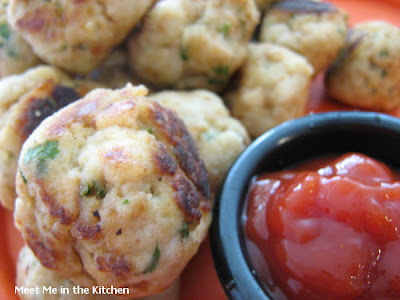 Those little meatballs look awesome, I am going to have to make a bunch and throw them in the freezer for my daughter, she goes nuts over meatballs! These ideas are wonderful! My kids take their lunch alot and I am always looking for new ideas! thanks! Will you make my lunch to take to work? Seriously...everything just looks yummy! I bring my lunch to work, and I'm definitely going to give the chicken meatballs a try!